India has a literacy rate of 73 percent which means about 33 crore adults are still illiterate in India. If HRD Minister’s statement is to be believed, India is hoping to achieve 80 percent literacy rate in period of next 2 years (2015). This means that over 8 crore adults from 33 crore who are illiterate will need to be educated. Comparatively, in last 12 years, since the census in 2001, 20 crore Indians have become literate. To achieve the goal of 80 percent literacy, the HR Ministry is panning on restructuring the entire adult education system in the country with a paradigm shift to lifelong education. One of the important aspects of this restructuring would be to give official recognition to informal education channels (Channels of learning that are other than the traditional School-College learning system). As part of restructuring, the HR ministry is also planning to recognize, validate and accredit learning obtained through adult education by setting up equivalency framework. In this regards, HR ministry has also developed a core curriculum framework for adult education, which will be introduced soon after the current consultation process is complete. The new framework will address total quality management for adult literacy. The ministry also plans on providing providing adequate resources including funding, research complemented by knowledge management systems and through other innovative means that includes use of computer ICT as a medium of instruction. There is no doubt that literacy forms the cornerstone of growth for any economy, especially for a developing nation like India. Across the globe, over 70 crore adults are illiterate and most of them are from India, China, Pakistan and Bangladesh. In our view, along with need to increase literacy, it is also important that our formal education system also sees some king of overhaul. Here are 5 things we hope that are changed in Indian education system! "India To Achieve 80% Literacy Rate By 2015, Adult Education System Will Be Overhauled! ", 5 out of 5 based on 1 ratings. The education system is the backbone of every country. 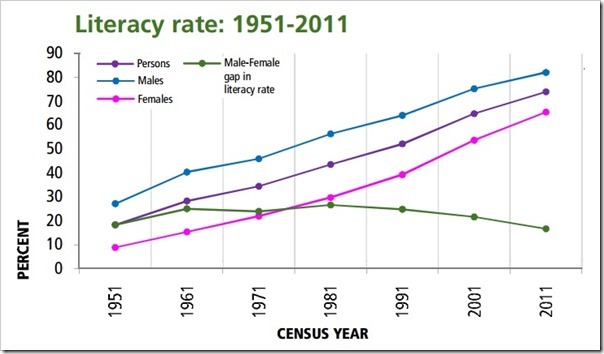 it is miserable that India will achieve 80% literacy by 2015 why not 100% .. Both the Government as well as the common people responsible for this situation in India. We should change our mind towards education and should think Education is the primary right for every child as well as for adult. So as a developing country it’s the responsibility of every Indian to increase the literacy rate.